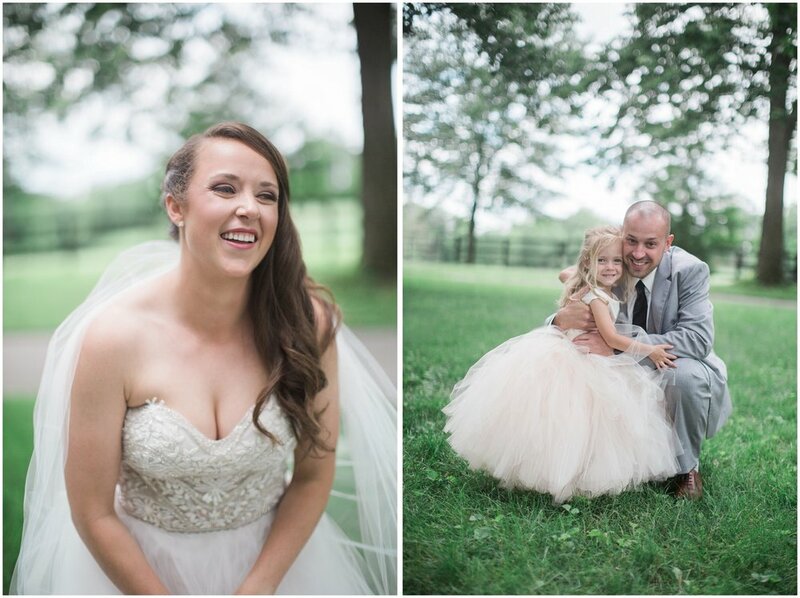 This beautiful horse farm was just perfect for Alex + Jarrod's wedding day! From the Bride: Our wedding was one of the most memorable, family-filled, amazing days that I have experienced so far in my life. Our friends and family surrounded us on a beautiful spring day! 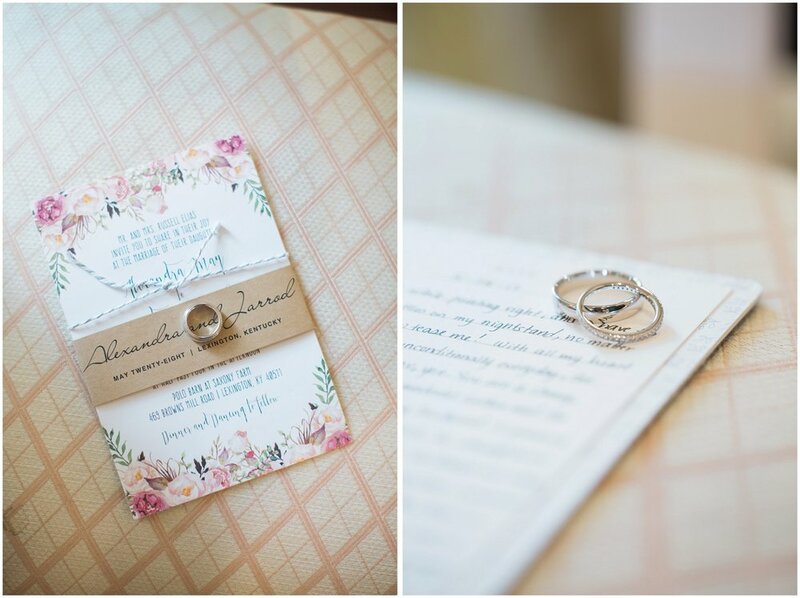 Jarrod and I decided to write our own vows and wait to see each other until the ceremony, which made the ceremony that much more special! It was everything I had envisioned and then some, I am so happy to finally be Mrs. Sims! Growing up, I knew that I wanted to get married on a farm, outdoors, in the spring so I could carry my favorite flower, peonies. And if I could have horses included, that would be icing on the cake. The Polo Barn at Saxony Farms was the first and only place that we went to visit and I knew instantly that I wanted to get married there. I knew right away that I wanted our color palette to be a very neutral color palette with lots grays, wood elements and light pinks in the flowers. My mom, Christy Elias, used peonies that she grew for our wedding for all the decoration. I bet after it was all said and done we probably had close to 200 individual peony stems. For my dress, I knew I wanted something strapless, with a sweetheart neckline and I wanted it to be full on the bottom! At our very first appointment, every one of the people I brought with me was able to “pull” a dress. The dress I ended up saying “YES” to was the dress my mom picked! She is my best friend so it is only fitting that it was her pick! For our cake we decided to go with a naked cake adorned with my mom's peonies. White cake with a raspberry, white chocolate filling was one flavor (my favorite) and the second was a strawberry champagne cake with a cream cheese frosting! Our dinner was absolutely amazing and so many of our family and friends told us how much they enjoyed it! There were so many elements in our wedding that I would consider unique and they are the things that I loved the most! 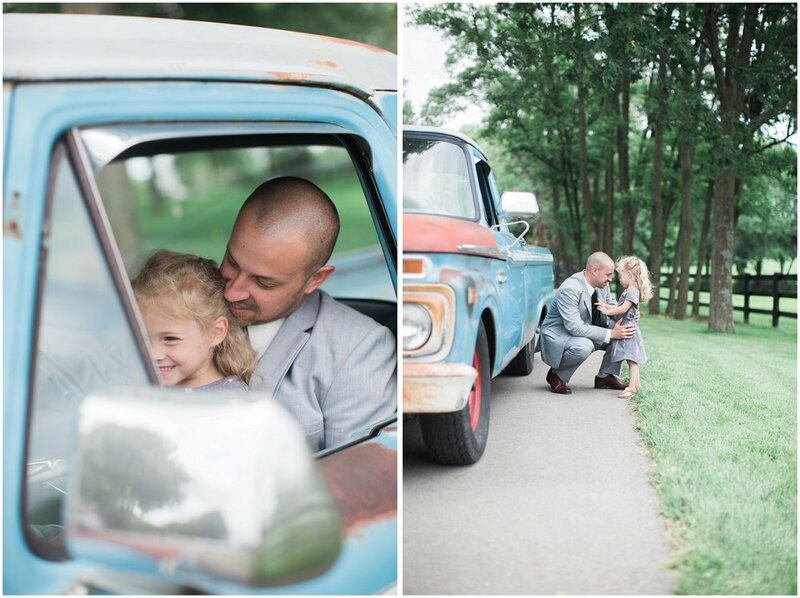 The first being, that Jarrod’s daughter, my now stepdaughter was able to play such a big part in our wedding! In lieu of a unity candle or unity sand, we chose a more personal touch and both vowed our commitment to Paisley as our daughter and step daughter. We gave her a locket and played our song that we always sing to her, “You are my sunshine”. She helped us cut the cake and even slipped into our first dance! She loved being able to run around in her “wedding dress” and talks about it all the time. I love how special that was to have her be a part of our wedding. Another part of the ceremony we loved, was when my mom read her favorite passage about love. I am a 4th grade teacher in Lexington, so something else that I loved was, my Matron-of-Honor and also my teammate got up during the ceremony and read marriage advice from my students! I loved it and they definitely made us laugh!!! Off the top of my head, they told us in order to be happy we needed to, “buy more animals!” So simple! My now brother-in-law, Calvin became our “minister” and married us! Our siblings and family were in our wedding, along with Jarrod’s dad as his best man. When my parents got married, 31 years ago, my dad wore red, Budweiser suspenders and Jarrod told my dad how much he loved them and wanted to keep the tradition going, so my parents bought Jarrod his own pair to wear on our wedding day! My dad had actually lost his original pair; so little did my dad know that we had also bought him a new pair as well! The 1965 Ford restored by my bridesmaid's husband was the perfect addition and fit so perfectly into our vision that we were trying to create! Some of my favorite pictures are in front of the truck! My cousins, who live in Pomeroy, OH, own a brewery! So we were able to use their craft beer at our wedding, which was another personal, unique part of our wedding! Another unique element that I loved was our signature drinks! We decided to do Kentucky and Moscow Mules! Well, to make it a little extra special, my dad was able to get us Copper Mule Mug with our own personal stamp on them to give away as our favors! I loved how they looked at each place setting and knowing we could give our guest something they would use and remember! Almost all of the small details in the wedding were DIY! The advice that I would give brides planning their weddings is to let people help you! I know I was guilty of trying to do everything but allow people to help in the process! Everyone is just as happy to celebrate in your big day and they wouldn’t be offering to help if they didn’t truly want to help.